It was good to get home. St. George is such a great place to live. We were glad to see Eric and find that he was doing well. His sisters kept him in line and saw that he was where he should be at all times. We especially enjoyed seeing Siena and Cara as they are the cutest! Deb and I have our sleep cycles all mixed up so it will be a few days before we feel back to normal. I'm glad the weather currently in St. George is sunny, albeit, cold. I wish Thailand was closer to our home but the distant travels is part of what makes it so special to go visit. This blog entry if from the Hong Kong airport. We are making another connection. We barely made our flight in Phuket, Thailand. It took us longer to get through immigration than we thought it would and our taxi driver kept taking bathroom breaks on the drive from Ao Nang to the Phuket airport. I think he had a medical problem. The upcoming flight is going to be long as Deb and I do not have seats together and it is a 13 hour flight. Now that our vacation in Thailand is over I just want to get home. This is the miserable part of going so far away. It is Saturday evening at 11 pm local time and back home I believe it is 8 am on the same day. Well the moment has arrived. We are packing and getting ready to check out from this fabulous resort. We both just had an hour long massage. I did the traditional Thai massage which pleasantly hurt. Debbie had a coconut massage and scrub. She smells terrific. The first part of our journey back home should be OK. With boat rides and drives through jungle and small towns, but the airplane journey is not anything to look forward to, only something to endure. It is Saturday Feb 5Th at 1 pm as I write this blog entry. We have 30 plus hours of traveling ahead of us. See you all soon. We do miss everybody and especially our little grand daughters of course! This day started out like many of the other days here on our trip. Early breakfast watching the sunrise then off to climb somewhere. Today Deb didn't rope up, instead she just watched me climb with the guys from Southern Utah (Ryan, Skyler, & Jesse). They had me trying some hard routes. Mid afternoon we joined several other backpacker tourists and went on a 7 island snorkeling tour. We went out on a long-tail boat and stopped at several small islands. Some had some good snorkeling others were just OK. I did get stung by jelly fish a couple of times. We then stopped on a small beach on Chicken Island and had dinner. The tour guy just served us Rice Wine (no thanks) and rice with fish curry. The seafood was a jumble of things one of which was a whole fish head with its eye looking at me. We watched the sun set in the west and then we all waded out into the surf and crawled into the overloaded boat and went to Pineapple Island where we snorkeled one more time. At first I was confused because they didn't give us any underwater flashlights but after dropping into the water and swimming around with my mask on did I understand what we were there to see. Bio fluorescent plankton! It was so cool! Every time you would move your hands or feet through the water the plankton would fluoresce and it was like hundreds of stars or fire flies swarming around you. Way cool! In the morning we have to start getting ready to travel home as this is our last night here. It went by way too fast! We started out today climbing at the wall nearest our resort and one that has several easier lines. Earlier in the trip I had Deb try one of the climbs (which I consider one of the best routes I have done here in Thailand) called "Wee Sad". It has a difficult start but is easier after that and climbs a cool stalactite and at high tide is above the water. She couldn't get through the opening moves and became quite frustrated and we had a little tiff over it. So we started calling the climb "We Mad". So today I gave her the cheerleader boost and she climbed it successfully. Now we call it "We Glad". This afternoon I had a pet monkey lick the sweat off my forehead. 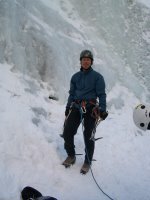 I was climbing with some hot shot climbers from Southern Utah on some overhanging sick hard climbs when they introduced me to their Thai friend's pet monkey "Harry". He was friendly but I heard he has bit a few people at times. Deb and I finished off the day with a "couples massage" at one of the spas. It is going to be hard to go back to reality in a few days. Tomorrow we have plans to climb and then go on a snorkeling tour of some nearby islands. Today we got up earlier than most of the other climbers in Railay and got on some climbs before the gazillion "Euro" climbers showed up. We then decided to try and take a short cut through the cliff to another climbing area via the Thaiwand Cave. We started into the cave and found some bamboo ladders helping us up some steep slippery areas. Soon we had to put on our head lamps. Once inside I had a difficult time deciding which passageway to take. Soon I saw daylight and heard climbers talking. I figured that we had made it through to the other side, but Deb insisted that we had already been there before. It then occurred to me that we had gone in a complete circle. Laughing I took a different passageway and several minutes and more ladders later we came to the mouth of the cave on the opposite side of the massive cliff that towers above Tonsai Bay. We had to rappel out of the mouth of the cave on this new side which put us at the base of another wall with many climbing routes. A very interesting way to get to the crag for more climbing. This morning I hired a local climbing guide to take me out to a limestone tower just off the coast and near where we are staying to climb it. It is named Ao Nang Tower. The climb consisted of 3 pitches of climbing with each pitch becoming progressively more difficult. The guides name was Tee and we hired a long-tail boat to take us out there and wait below. The weather was great today with no storms. The climb was very enjoyable and I even lead the middle pitch. I would like to think that I was one of his more fun guiding jobs of the season for Tee. Yesterday afternoon Deb and I were walking from the beach over to our resort and we were walking through a jungle section with large trees. There we encountered several monkeys. One large male started climbing down and came directly toward us. Deb quickly realized that the monkey had spotted the banana that she was carrying in her hand. Recognizing the monkey was coming for her she decided to place the banana on top of my climbing pack (without my knowledge I might add). The monkey then came for me and in spite of my gestures and shouts kept coming right at me and was perhaps 7 feet away. I was ready for this thing to pounce on me and I thought I might have to fight it off. The whole time I was puzzled as to why this monkey was after me. Fortunately Deb again realized the seriousness of the situation and grabbed the banana and quickly tossed it into the jungle vegetation. This solved the monkey chase and it darted into the fauna and found the banana and was eating it within seconds as we quickly walked on. She then told me why the darn monkey kept coming after me. Like putting the banana on top of my pack would fool the little rascal! ?